This is what Phil Parkinson is all about: he gets results. You can complain about the style of football, the poor signings, the conservative outlook. Yet what really matters is the progress that he has delivered over four years, and the way he has transformed the culture of the club. Phil Parkinson is our leader, and following him continues to bear fruit. And these are the moments that really characterise his management of Bradford City. His story at Valley Parade might be headlined by astonishing cup runs, but it his consistent ability to guide the club through crisis points that explains his longevity. There have been some really difficult occasions under his stewardship, and this dismal week has been another of them. But time and time again, Parkinson delivers when it matters. He masterminds crucial victories when the chips are down. It is such an important quality, and it is one that should never be dismissed. One of the main reasons that many of his predecessors failed in the Valley Parade hot seat was because they couldn’t ride the frequent storms. When the going got tough, the pressure grew, and the losses totted up, so many former City managers couldn’t find the answers. Here at Spotland was another great example of Parkinson’s calmness. His belief in what he is trying to do. His confidence in the people around him. The manager has received a bucket load of stick this week and some of it was merited; but he has the experience and assurance to know that such hysteria comes with the job, and that it has to be treated as background noise. He knew that he would get it right, and he got it right in a big way here. The personnel has kept changing, but this victory was a typical Parkinson backs-to-the-wall performance. The old 4-4-2, with one of the wide players tucked inside to provide defensive cover. The direct ball from the back when required. The pace down the wings for variety. The intensity in the tackle, from defence to attack. The high pressing, and the pushing of the opposition onto the back foot. Rochdale were no pushovers, but by the end the early season high-flyers looked demoralised and as bereft of ideas as the Bantams had been over the last two games. City had turned the tables. And that Parkinson masterminded this triumph without his longest serving player is a big talking point. James Hanson’s demotion to the bench had been hinted in the build up, but still came as a shock. He has been a long way below his best, but none of his striker rivals have been pulling up trees either. People often make Hanson the scapegoat, but until now that has never included his manager. Parkinson’s preference for Steve Davies was a leap of faith given the torrid week his summer signing from Blackpool has endured. For a while it remained a questionable call. But then shortly after half time Davies chased a long punt, pressurised a defender trying to shield the ball out for a goal kick, and succeeded in muscling him off the ball. It was as though Davies had turned into Alan Shearer. Davies charged into the box and cut the ball back for Devante Cole, who scrambled the ball over the line to score his fourth goal in seven games. It put City 2-1 in front when the contest was still an even battle, and from that moment they never looked back. Three minutes later the visitors were 3-1 up and on course to justifying every single one of Parkinson’s tough team selections. And it was a goal inspired by a returning hero, who’s signing on loan 24 hours earlier had given everyone a huge morale boost. An hour into his second debut, Kyel Reid picked up the ball outwide, level with the edge of City’s box – and just seconds later he had run the whole length of the pitch, terrorising defenders, and won a corner. From the set piece, Lee Evans crossed and Olly Lancashire headed the ball into his own net. 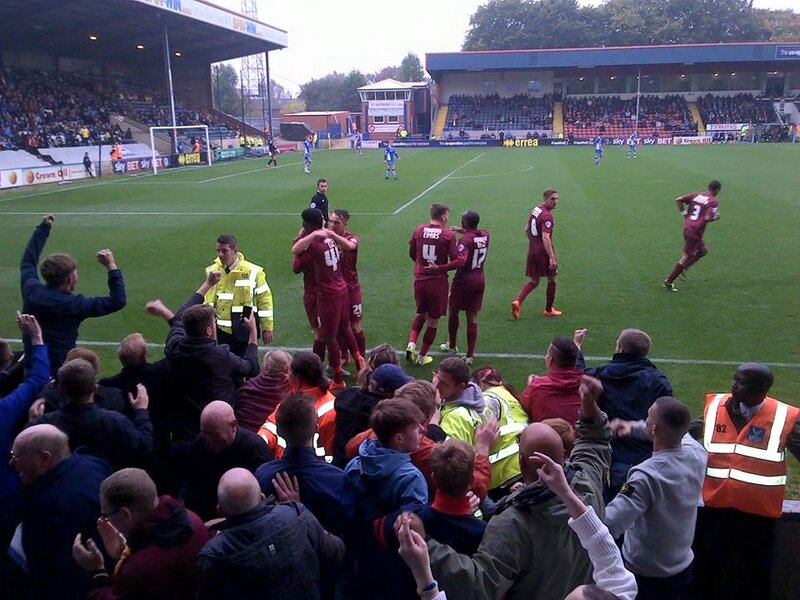 3-1 Bradford City. It left an ecstatic and packed out away end chanting Reid’s name. It was like he’d never been away. A quiet first 45 minutes was followed by a second half spent destroying Joe Rafferty. There were fears that the terrible injury Reid picked up at Bramall Lane 20 months ago would cost the winger his soaring pace. Forget it. Reid is back, and as lightning fast as ever. His confidence was flying by this point. Reid was in full flow, running at people and producing fancy flicks. Above all else, Reid was playing with a smile on his face. Shortly after City’s third, another excellent Reid cross found Davies with his back to goal, and the 27-year-old unleashed an acrobatic volley that flew narrowly wide. If it had gone in it would have capped off a strong Davies display that got better and better. He lacks Hanson’s physical presence but led the line impressively. Davies played with a level of aggression that was occasionally borderline legal, but such Diego Costa-style intensity brought out the best of him. Hanson, watching on from the bench, might want to consider adding this type of aggression to his own game. Hanson will be hurting from his demotion, but will come back stronger for it. Whilst Davies and Reid stole the show, this was a team performance packed with character and determination. Parkinson got what he needed from his defence, who shook off a couple of early nervous moments, and the imposing challenge of Calvin Andrew, to keep Rochdale’s 4-3-3 largely in check. Rory McArdle’s return from illness was a huge boost, whilst behind the back four the recalled Ben Williams was a major improvement on the shambolic recent displays of Brad Jones. And in midfield City eventually won a fiercely contested game. Tony McMahon’s move to the wide midfield role, tucking inside, was a brilliant call by Parkinson. McMahon has endured a difficult season so far and attempts to play him in the centre of midfield have gone badly. McMahon is never going to be the star of the show, and in the wide role he doesn’t need to be. His quality on the ball was evident and his tough tackling helped Stephen Darby behind him. McMahon’s quality also benefited Evans and Gary Liddle in the middle of the park. Liddle’s midweek demotion was heavily criticised, but so far this term he has struggled to hit the heights of last season. Back in the side, Liddle’s composure and drive was important in keeping City motoring, whilst in front Evans was able to spray passes around and make intelligent late bursts into the box. Evans is a terrific capture by Parkinson and he looks every inch a Championship player playing below his true level. Evans struck the all-important first goal here after a McMahon free kick bounced kindly into his path, leaving him to fire the ball home one-on-one past Josh Lillis, with other City players queuing up to have a go too. Rochdale equalised seven minutes later when defenders backed off and the highly impressive Peter Vincenti was given too much space to slot home. Evans remained an inspirational figure as City firmly took control after the break. He will be badly missed when on international duty next weekend, but has firmly overtaken Billy Knott as Liddle’s best midfield partner. The closing stages of the game offered just as much heart as the way in which City had won their individual battles in the first place. Holding onto leads has been a big problem for more than a year and the two-goal advantage left the Bantams in that nervous area of not knowing whether to push or see time out. They took the former option in a measured way. They kept pressing Rochdale, and attacking in numbers. Keith Hill made a triple substitution as he tried to turn the game, but he knew that he couldn’t chase it too hard and risk being exposed by the pace of City’s counter attack. Both Reid and Cole – who was much better here – frightened the life out of their opponents. City could have got a fourth with substitutes Hanson and Luke James pressing their claims for a starting spot, and Evans going close to his second. At the other end Williams made a couple of decent saves and then, deep in stoppage time, produced a stunning finger-tip stop of Matthew Lund’s powerful free kick. A second Rochdale goal would have prompted fear and panic, but City were in no mood to give their hosts even a ray of hope. And that unwavering intensity was the most commendable feature of the day. Whatever criticisms have been thrown at the players and Parkinson of late, there is no doubt that this team were playing for their manager here and that they firmly believe in what he asks them to do. In a week where the departed loanee Alan Sheehan stated there is an inner circle of players that he couldn’t penetrate, here was evidence that Parkinson’s core values continue to have the squad’s buy-in. The inner circle is strong. This was Northampton away in 2012, Burton Albion in the play offs in 2013, Port Vale home and Leyton Orient away in 2014. A classic “stones” performance. Phil Parkinson keeps delivering them. A good man is hard to find, and Parkinson’s recently signed contract shows that the City board dare not lose theirs. Other clubs – currently wrestling with the dilemma of sacking their under-performing manager – will be jealous of such proven stability. In an environment of short-term mood fluctuations that trigger extreme reactions – and in a profession that will always throw up difficult moments – Parkinson’s ability to produce this kind of result continues to serve Bradford City so well. Surely if Hanson adds any more aggression to his game he’ll be sent off every time he takes to the field?! I know Stix and the like are starting to sound like conspiracy nuts but he does seem to be a marked man by both defenders and referees every match. It’s a minor point on Hanson, but Davies play in a very aggressive way that was borderline on occasions but enabled him to bully the Rochdale backline in the end. Hanson is not a nasty player (despite what referees think) but it would be interesting to see if he could play with a bit more bite, in a controlled way. Incidentally Hanson played well when he came on. Yeah, I’ve never thought of Hanson as a dirty player, though I don’t see many full matches any more. Certainly not a niggly, sneaky wind-up merchant like Windass was! Just frustrating that two defenders can sandwich him off the ball or have his shirt over his head and the referee refuses to give him a free kick. It’s very odd! Is that crisis over now, we’re going to win the league, Parkinson IS the special one, after all, Williams and McMahon and Davies are really very good, not rubbish, our tactics were spot on, i.e. McArdle to Davies (not Hanson) etc etc etc…………………………………………? I am assuming this is supposed to be sarcastic. No one is trying to say City are world beaters, but after a week where the players and manager have been slaughtered by a section of fans I think they deserve a hell of a lot of appreciation for achieving that result. They are not as bad as has been suggested after all. Sorry, I was being sarcastic – I was just gobsmacked at some of the opinions coming out after a bit of a bad run, and I agree with what is said in the above reply. Its a fantastic result but we need to start doing this at home as well as away.